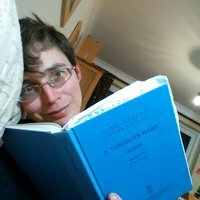 Helen Lovatt is Associate Professor of Classics at the University of Nottingham. She studied Classics at Pembroke College, Cambridge, where she wrote her PhD on the athletic games in Statius Thebaid 6, under the supervision of John Henderson. After a temporary lectureship at Keele University, she held a Junior Research Fellowship at Murray Edwards College, Cambridge (then New Hall). In 2003 she joined the department of Classics at the University of Nottingham. Helen Lovatt has published two books on epic poetry (Statius and Epic Games, Cambridge 2005 and The Epic Gaze, Cambridge 2013) and an edited volume on vision and epic (Epic Visions, Cambridge 2013). She is currently working on children's literature and classics, the Argonaut myth, trauma and grief in Virgil’s Aeneid and Flavian epic.